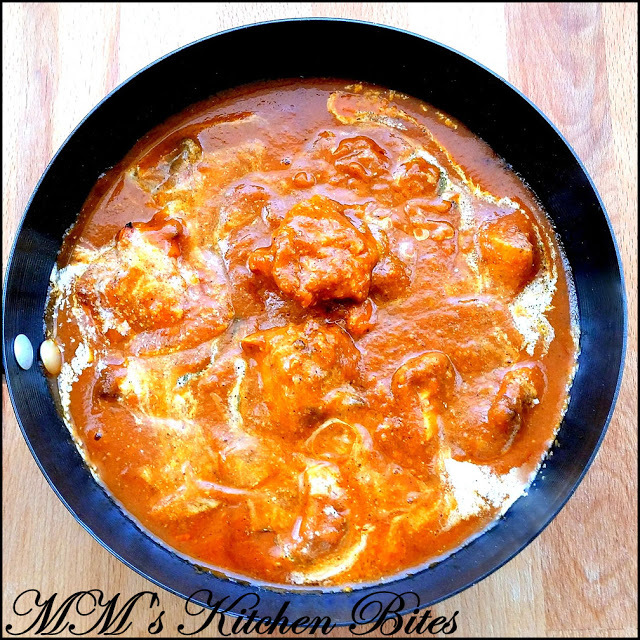 Home British Chicken Tikka Masala…Celebrating National Curry Week!! Slash the chicken thighs at an angle 3-4 times to ensure the marinade will seep in. Put the chicken in a non reactive bowl and add lemon juice and salt. Mix well and leave to marinate for about half an hour. Whip all the ingredients mentioned under the second marinade list in a small bowl. Add to the chicken, stir well to coat, cover and leave to marinate in the refrigerator overnight or for at least 4-5 hours. Bring the chicken to room temperature before cooking. Heat 2 tbsp ghee in a large non stick pan over medium low heat. If using whole spices, add now and let them crackle in the oil for about 10 seconds. Add the ginger and garlic pastes and fry till fragrant. Add the onions and fry until soft and starting to turn golden brown. Add in the tomatoes, tomato paste and the ground cardamom, clove and cinnamon powder. Mix well and cook down the tomatoes till the release oil on the sides of the pan, about 15-20 minutes. Keep stirring and cook for a further 10 minutes or so till the colour of the tomatoes darkens a little more. Add in 1 cup of water, increase the heat to high and bring to a boil. Switch off the heat and let the sauce cool a bit. If you have used whole spices, fish them out of the sauce now. 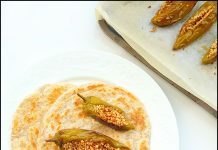 Using am immersion blender or food processor, puree the sauce until smooth and then pass through a fine mesh sieve to remove any seeds or skin that may have remained. Discard the solids and set the liquid aside. Meanwhile, heat your grill/broiler to the highest setting or heat the oven to 240 C. Place the chicken on a foil lined baking sheet and place the tray on the topmost level in the oven. Cook for about 4–5 minutes on each side, until nicely charred at the edges. Remove from the oven and let the chicken rest for about 5 minutes before cutting into bite sized chunks. The chicken will still be pink inside – it will be cooked in the curry later. Heat the remaining 1 tbsp ghee/butter on low heat. Add in the Kashmiri red chili powder and green chilies. Sauté on low heat for about 8-10 seconds – adding Kashmiri red chili powder at this stage in oil gives a deeper colour to the dish but don’t allow it to burn. Add the pureed sauce back into the pan with about ½ cup of water, bring to a boil on high heat and then allow to simmer for 4–5 minutes. Check for seasonings and add salt, sugar, and red chili powder (and more Kashmiri red chili powder if needed to get the colour you want). Add in the chicken chunks, half of the cream, fenugreek leaves, garam masala powder and simmer stirring often for 4-5 minutes or until the chicken is completely cooked and the sauce consistency is to your liking. Stir in the remaining cream. Taste and adjust the balance if needed by adding more salt, sugar, lemon juice or cream. Garnish with chopped coriander and/or fresh green chilies and serve hot with naan or paranthas. The amount of Kashmiri Red Chili powder you need to use will depend on the tomatoes and the final colour of the dish you are looking for. Please do adjust to your liking. Previous articleChinese 5 Spice Beef stir fry with Soy and Ginger…dump and crop!! Next articleFrench Apple Cake…let’s keep the doctor away!! Lol, I generally prefer cooking with chicken on the bone, rather than boneless, chicken tikka is one exception to that rule though. Despite growing up in the UK, and coming from a family with multiple family members working and owning Indian restaurants, I have never tried chicken tikka masala before, would you believe! It's something I have been wanting to get around to for ages. Thanks for the recipe!